The Evil DM: This is how I roll! : The Evil GM - TPK, OH NO! It happens! I have no problem with characters dying from bad choices. In the example given the player made a bad choice by turning left and ending up in a dead (literately) end instead of turning right and escaping. If the player had the knowledge of which way to turn and failed due to bad memory or not paying attention then its their own fault...but if the player did not have that knowledge and it was nothing but a random choice then it looks like the DM is just trying to kill the characters for his own amusement. To be fair, I've been in a few groups where the TPKs actually were fun. The party went in with the right attitude of it being a game and they were pleased to go out in a blaze of glory. Now, granted, most of the time there's frustration and in the aftermath a sense of "Erm... OK, now what?" I mean if your campaign isn't episodic in nature and have a unifying over-arching plot, how do you integrate an entirely new party into that? 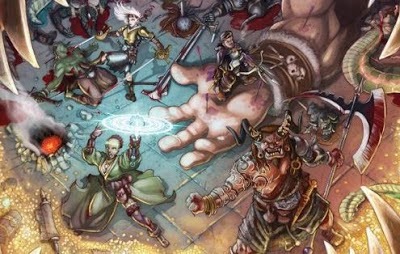 The true danger of a TPK, for me, is that it can kill the momentum of the players and invalidate the hard work of a DM. That being said, if players and DM work together, they can find a way to keep things going in a believable and entertaining fashion. Make the next game the ghosts of the character's seeking to train the next group in, telling them about the overarching plotlines, giving them the pointers of hindsight. Or they all wake up in chains on a galley ship.